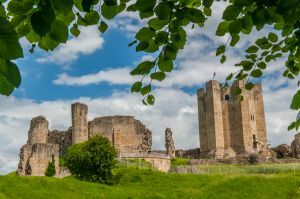 Conisbrough is an imposing 12th-century castle said to be the inspiration for Sir Walter Scott's novel Ivanhoe. The castle is set on a natural slope above the Don Valley. In the 11th century Conisborough was owned by Harold Godwinson, later King Harold. The name is a reminder of this royal connection; it is likely a contraction of the Saxon Cyningesburh, or 'King's burh'. After the Conquest, it formed part of the estates given by Willliam the Conqueror to his son-in-law, Earl Warenne, and the Warenne family retained possession of the castle until the 14th century. It was later owned by the Dukes of York and was also owned by the crown for a time. The castle is set upon a natural defensive position, with a hill rising to the west, with the gap between the hill and the castle forming a deep ravine. This ravine was crossed by way of a drawbridge which was the only entrance to the castle. The first castle on the site was little more than a wooden palisade. This was replaced by a stone castle in the current layout by Earl Hamelin Plantagenet, Henry II's half-brother, who owned Conisbrough from 1163-1202. The imposing stone keep dates to this time; it was probably built between 1180-1190. It is probably the first example of a circular stone keep in England; before this time keeps were generally square or rectangular in shape. It is also the only known example of a castle in Europe built from magnesian limestone. The keep is four storeys high and is supported on 6 large rectangular buttresses. The keep has welcomed royalty in its time, for it was here that Hamelin hosted King John in 1201. Shortly after the keep was finished, a stone curtain wall was added for further defence. The castle gradually fell out of use during the 15th century, and by the Tudor period it was described as ruinous. 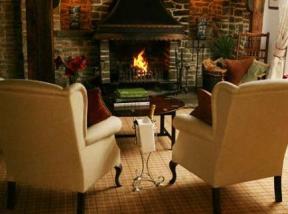 Location: Open all year except Christmas and New Years (see English Heritage website for details).